I'm interrupting your regularly scheduled posts with a logo idea. 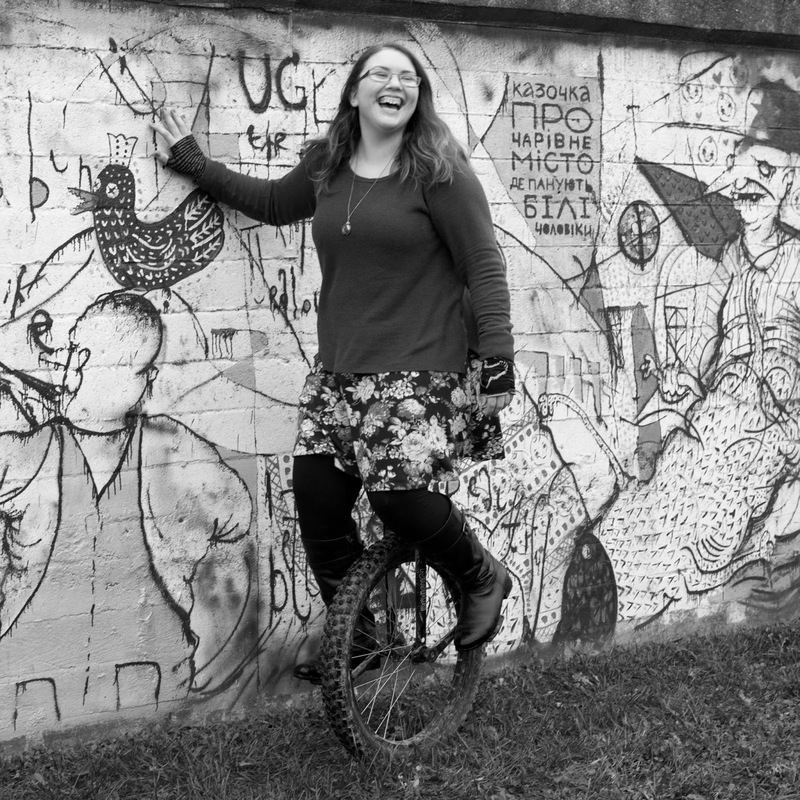 I'm getting bored of my current header, and am considering making the blog background a little cleaner (but with the same picture). Its obviously not finished. I wanted opinions, though! What do you think? Be as harsh as you want, and as creative with your ideas as you want. I might try putting some pictures of stuff featured on this blog inside those rectangles, instead of the random-but-fun one I've got in there now. I wanted a place-- a key-holder of sorts-- to hang things on. Why bother buying something when you can make it? My room happens to be in the basement, and I have a breaker box above my desk. 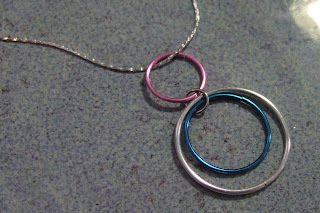 It would be ugly except for the fact that it is magnetic and I can therefore spruce it up. I made my holder magnetic. 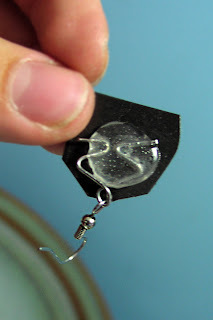 I'm sure this idea will also work for non-magnetic surfaces if you use tape. 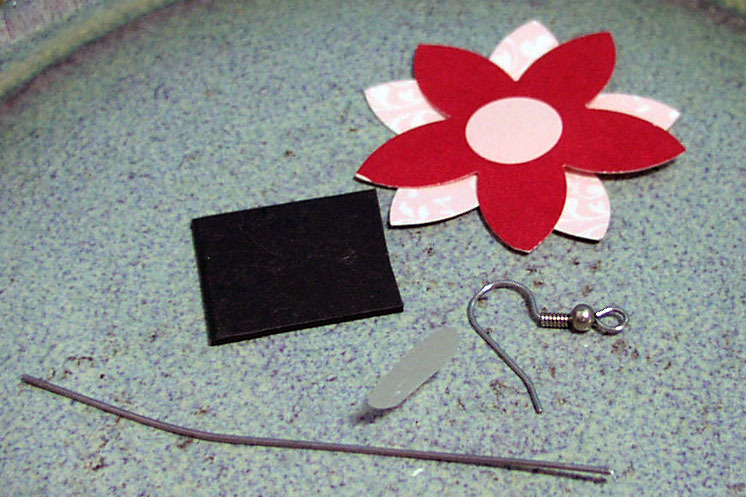 Thread the wire through the earring and fold it all over itself as pictured. Put the folded wire on the magnet square and apply the glue dot. Put your decoration on and stick the magnet on something magnetic! 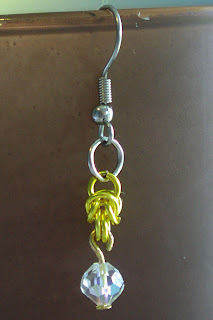 Here you can see that I hung my Fairy Bracelet on my new magnet holder! Oh, dear! 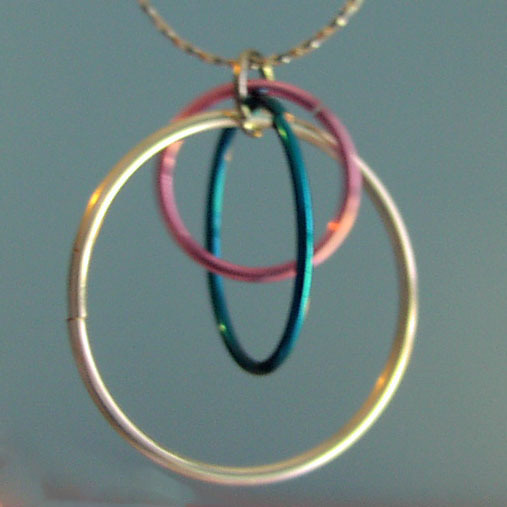 Some incredibly mismatched jump rings and a touch of color exploded all over my desk, changing my Firework Orbital design into a bright and cheerful explosion of dangling rainbows. What is the purpose of a mannequin? Art mannequins are no help, whatsoever. They are supposed to help artists understand the proportions, angles, and movements of a human being. The problem is that mannequins cannot move in the way that people do. My little mannequin cannot sit. It's hands can't touch its face. It can't cross its arms, tuck its ankles primly, or touch its toes. The little wooden joints simply don't do that. A mannequin can also bend in ways a human cannot. It's head swivels, it does more-than-spilts, it can stick is arms up... backwards. Overall, a mannequin is no help in art. 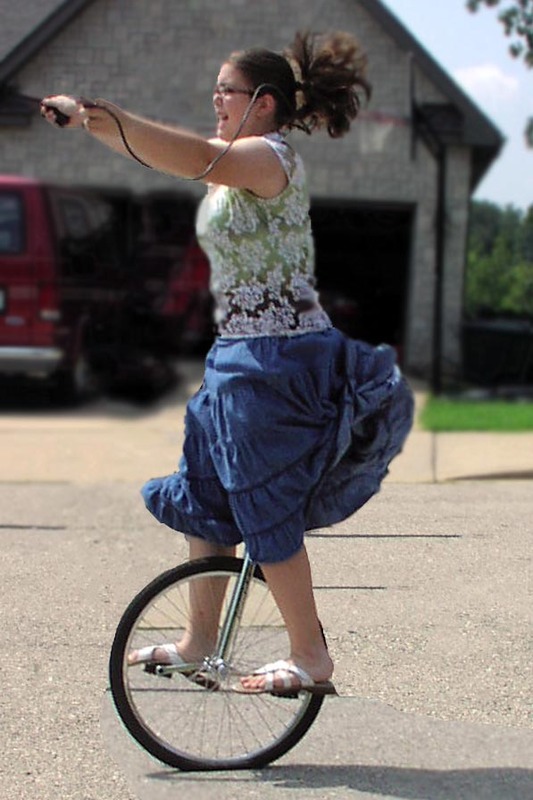 But I wouldn't use a mannequin to help draw a unicyclist. I tried, honestly I did. But my drawing-from-imagination turned out much better. I'm much more likely to get my little sister to take a blurry snapshot of me in action than I am to use a mannequin. I don't understand why mannequins even exist. The imagination is a MUCH better tool-- for me at least. Those of you who know me IRL know we are moving. Those of you who don't now know. :P This means that I will be busy packing and moving. I will probably have all of my arts and crafts stuff (minus my life-sustaining sketchbook) packed up for a month or two. In addition to all that, I've got the gumption to start school this next coming week (I am a proud homeschooler!) My siblings are going to wait until we move, but I don't want to work on school during next summer vacation. Yes, those are the books I am working on this coming year. That does NOT include my Latin and Chemistry texts, mind you. Nor does that stack include any notebooks, binders, lesson plans, etc. I use Kolbe Academy and am pursuing their Summa Diploma. It is a wonderful program, though it takes lots and lots of hard work and must be kept on top of if you want sanity. I can't believe I'm in the 10th grade now... and getting my driver's license soon... sorry, off topic, that is not art/craft/blog related. Not to mention that when we move, I will not have access to a internet-enabled computer for awhile... and when I do, I will have lots of I&F work. HOWEVER! I am not totally abandoning you, my dear blog readers. This summer I went on a crafting spree! I have just made over 20 posts, and still have about 10 more crafts to take pictures of (and then I need to scan in some artwork). I'm not going to post it all at once-- I think that makes it boring. Besides, I just did that a week or two ago! I am using Blogger's Scheduling feature. (Have you ever noticed that scheduling is such a funny looking word? It looks like a tidal wave. And how strangely people with British accents pronounce it?) What does that mean? 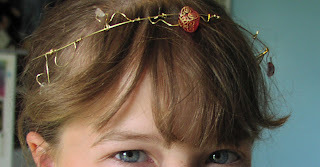 Every two days, until the end of August, a new post will magically appear on my blog! Every now and then I might add a new post in the mix of all those scheduled ones.But you are assured a new post every two days! How great is that? Alternatively, you can follow me via Blogger. If you do so, your blogger picture winds up on that pretty little widget (again on the right sidebar). One last word before I bid you all adieu. I wanted to try making a facebook page, just to see what it is and how it works. I had nothing to make it for, so I decided to make it for this blog. You can fan "Shealynn's Faerie Shoppe" on FACEBOOK and get updates in your news feed! You can see all my new blog posts on the facebook page, but the page is not as pretty as my my blog. :) Mean ole facebook doesn't let me mess with HTML! ALSO! I've been running out of people to give all my crafts to. I'm considering getting an Artfire account. It is alot like Etsy-- only Artfire's Basic account is totally free. I might give it a try once we move. What do you think? PS: Sorry this post was so long. :D I DO ramble! I'm like Dug from UP!-- I'll talk about something, and then, suddenly: SQUIRREL! I recently got together with some family friends, who are like little sisters almost. :) They are SO quick to catch on. 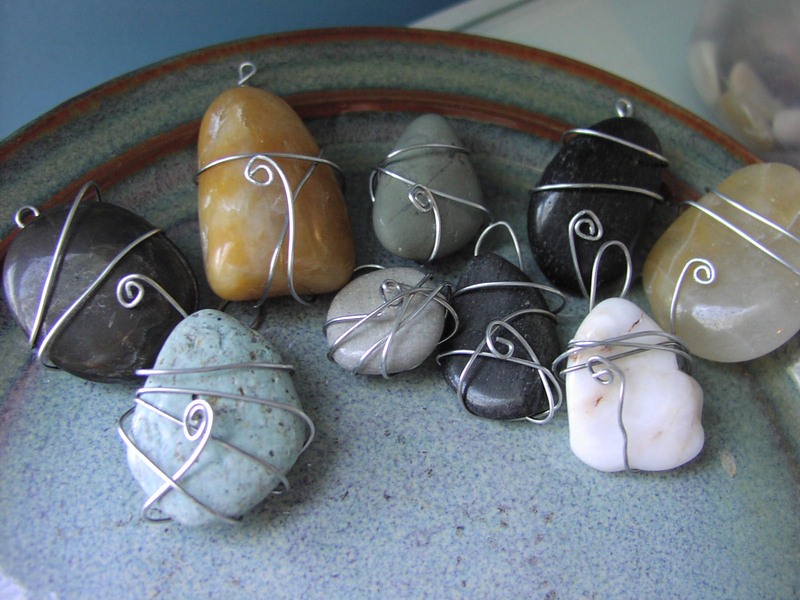 In the space of an hour, Marlena made the wrapped rock pendants (and developed a cool way of wrapping them) and Christiana made the earrings shown below: The rocks, and some other creations, are for our Church's Oktoberfest. The top two earrings are based off of my Peacock Garden. I loved how Christiana used Christmas colors in them, and then plain bronze topped with blue! The bottom left earrings are based off of my Musical Notes, and the right are based off my Fireworks. 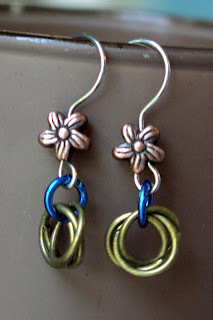 These reminded me of the striking tones of peacock feathers... And the chainmaille mobius looks rather like a flower of sorts, doesn't it? 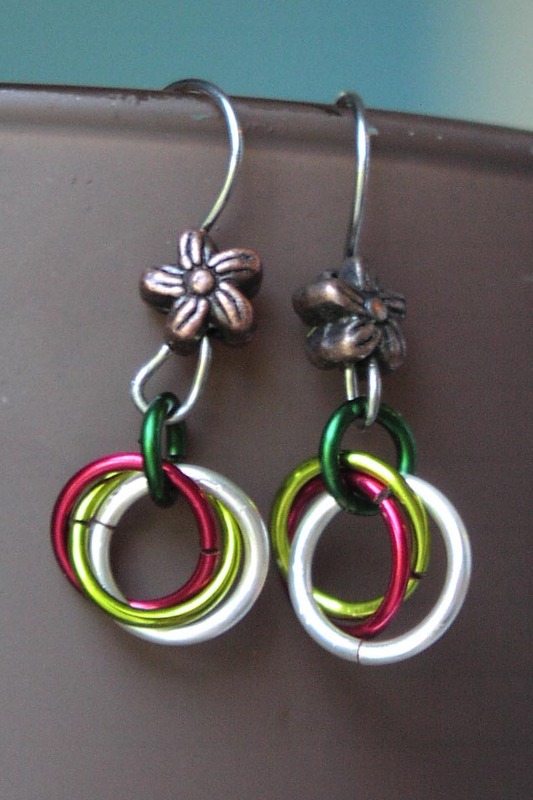 The flower beads on the earring wire only add to the garden effect. 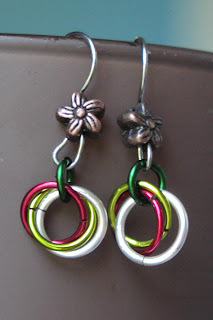 This is the sort of creation that occurs when you have a random assortment of jump rings. (Although very nice quality, from UnkamenSupplies) I had a total of four bronze-ish rings and two blue rings. What could I possibly do with such a tiny amount? Mix and match in the mobius! I wonder why I never thought of that before! It took me awhile, but I finally caught that elusive orb, the marble. I have captured it inside of a chainmaille globe, so that its fiery spirit can be forever seen-- but never again shall this marble roll under the depths of the couch, where it was discovered! 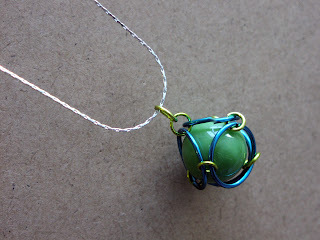 I wanted to post instructions for the making of this marbled cage or caged marble, but for me it was simply attempting to get the chain of rings to loop around the marble. It seems straighforward, BUT! marbles love to escape and fly underneath beds. Here is a picture of how I began (note that I used another blue ring after this). 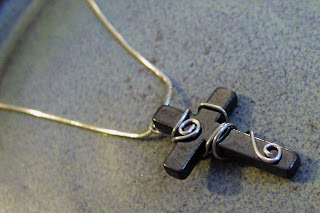 I got one of those cross necklaces from VBS last year-- the gray cross with metal caps that promptly broke. It seemed a pity to throw the cross away, but I had no way of attaching it to a string! 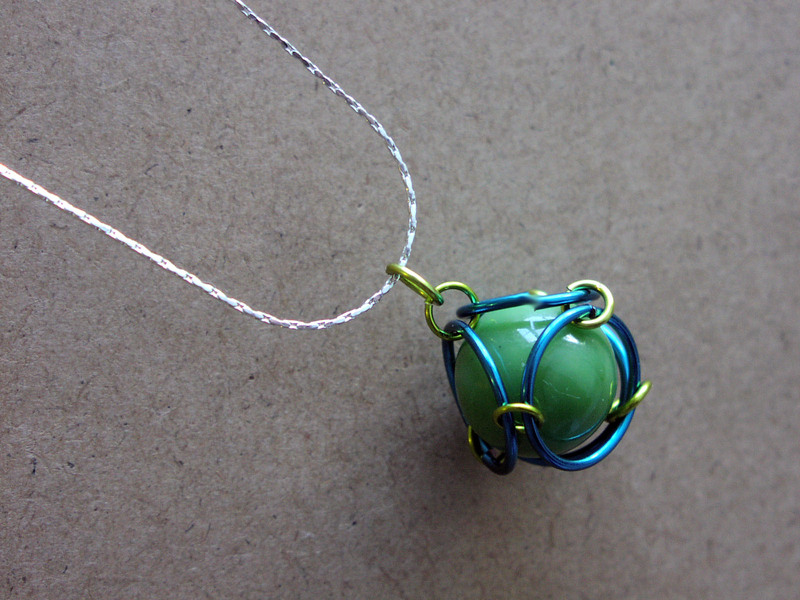 That is, until I figured out I could wrap wire around it. Now I have a fun and pretty cross to wear. To begin with, I am trying to add an RSS feed, which will automatically alert you if there is an update on the blog. Please look at this helpful blogpost, which explains RSS: HERE. Also, a more consise explanation HERE. Edit: I have added this feature, which can be found on the right-hand side of my blog. You can either subscribe via reader or by recieving email updates-- spam-free, of course. 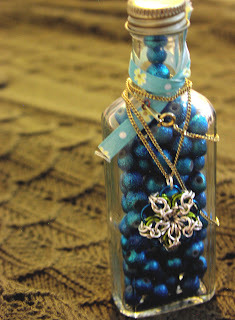 As you can tell, I have finally posted pictures of my latest creations. That is ALOT of pictures and posts. Please enjoy them! I spent three hours simply editing the pictures, uploading them, and writing posts. I've also updated many of my previous posts with even more pictures. 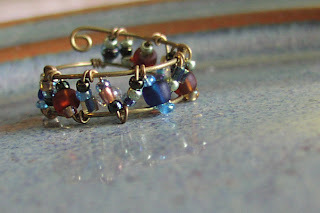 Chainmaille Bracelet and Attempts (fixed the broken pictures of the bracelet). This is actually supposed to be a pendant, not an earring. Actually, I wanted to make two of these as earrings, but I did not have enough jump rings. 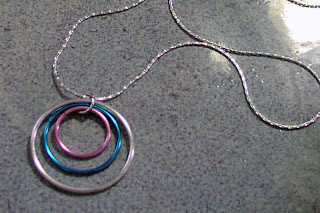 So now it is a necklace pendant. A really small one. It's just a little bigger than my fingernail! I made this for a friend, who is going to be doing a small acting part in a homemade Star Wars movie for another friend before she leaves to join the convent! 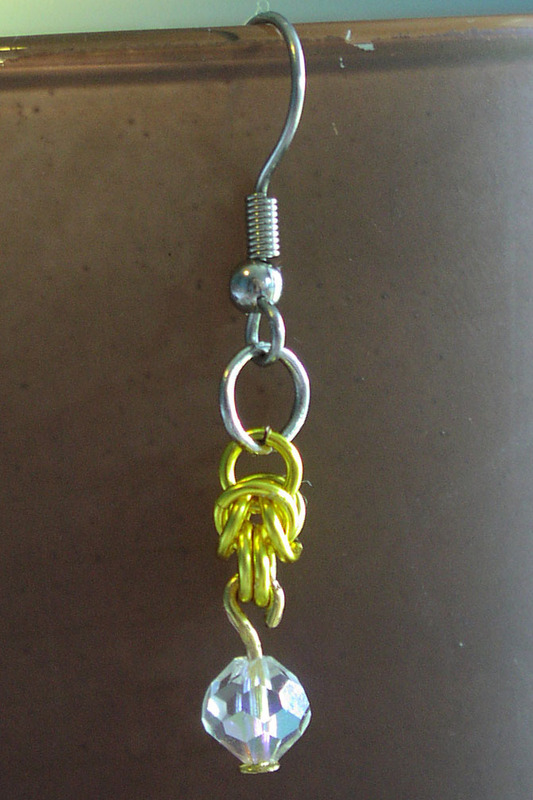 It is half a Byzantine weave with a little dangle bead on the bottom. 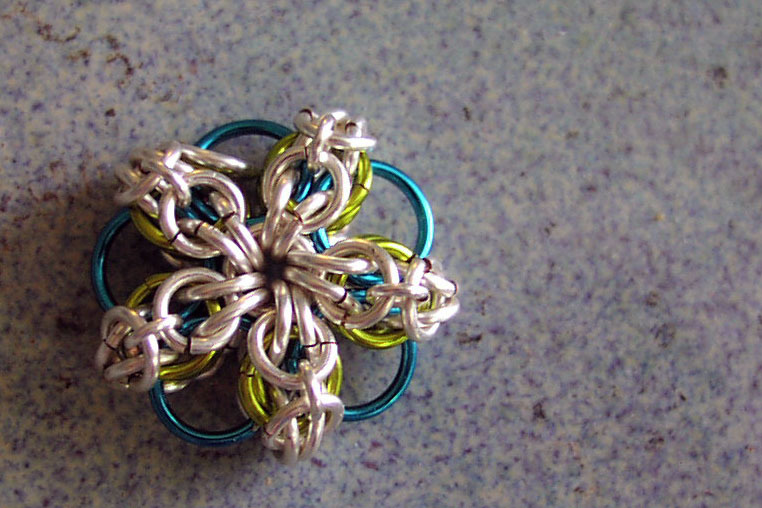 Maille Artisians International Leauge This website has a huge number of weaves, including descriptions of traditional historical weaves and the newer, decorative weaves. 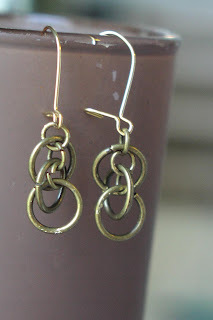 While some of their tutorials are confusing, this is the place to go with all chainmaille questions. Look here for inspiration, too. CG Maille Computer generated images that clearly explain the weaves. Best tutorials I have found. 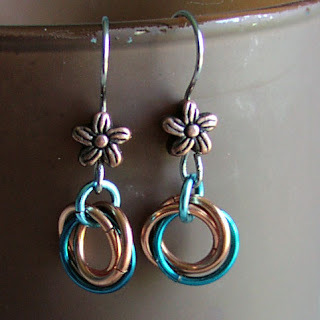 UnkamenGifts' Flickr Wonderful tutorials, although sometimes a step or two is left out. 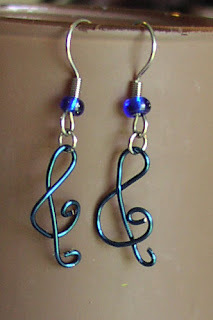 Etsy The online site for everything handmade. 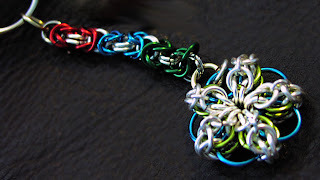 Type "chainmaille", "chainmaille jewelry" or any number of chainmail related words into the search bar. 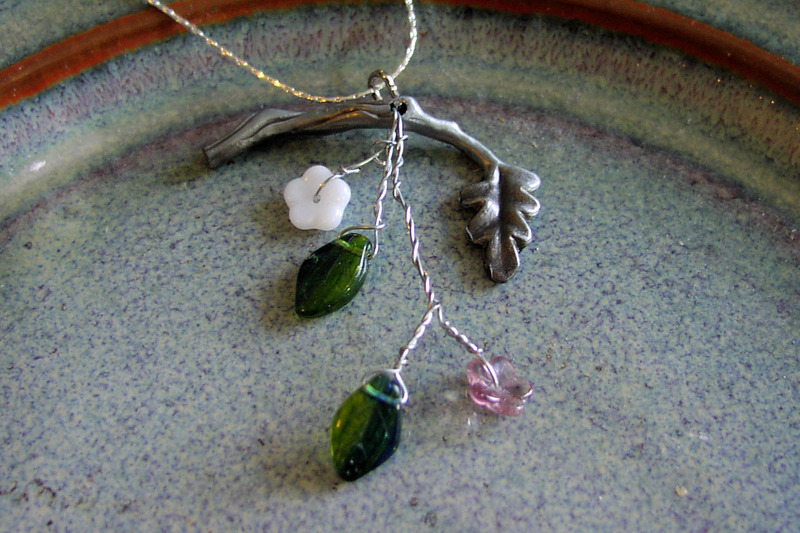 You can purchase other artisian's work, or simply look for inspiration. 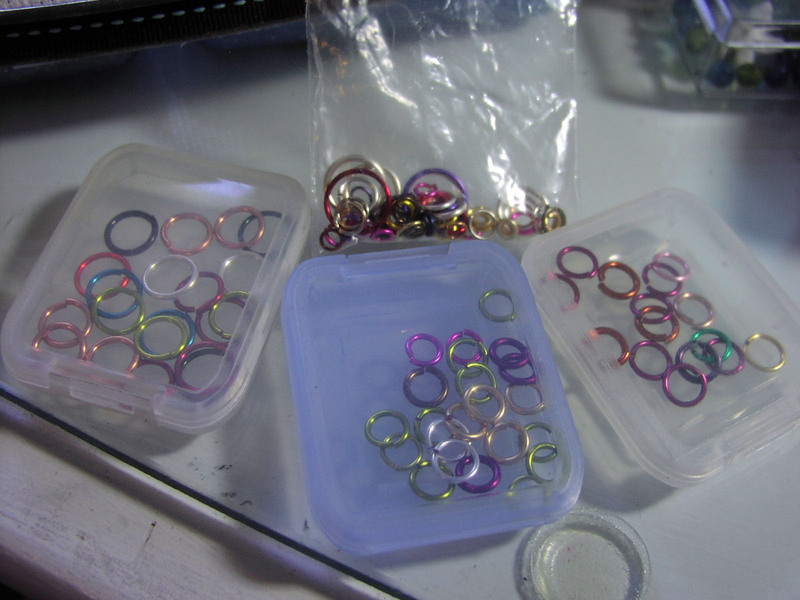 You can also purhase quality handmade jumpring supplies here. I'm sure there are other good sites out there-- these are just the ones that I find the most helpful. Chainmaille is a relatively small niche in the jewelry community, so instructions can be scarce. Of course, it is quite easy to find instructions on making chainmail armor-- but that takes FOREVER. 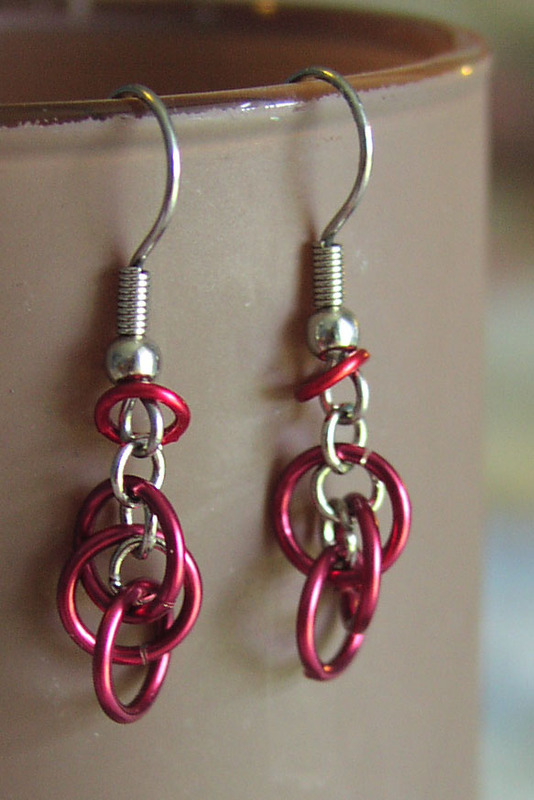 Chainmaille! 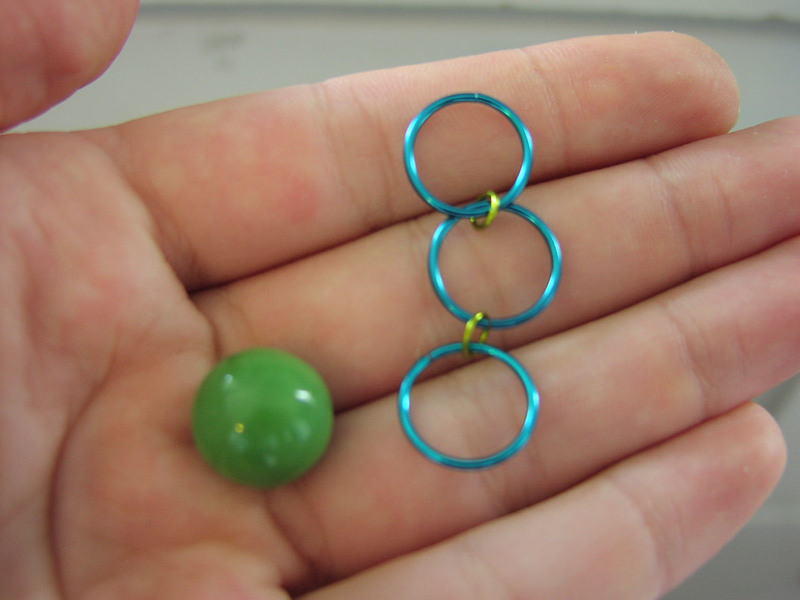 Little random things like these earrings are the result of having a limited number of jumprings to work with-- and an even smaller number of similar color and size. 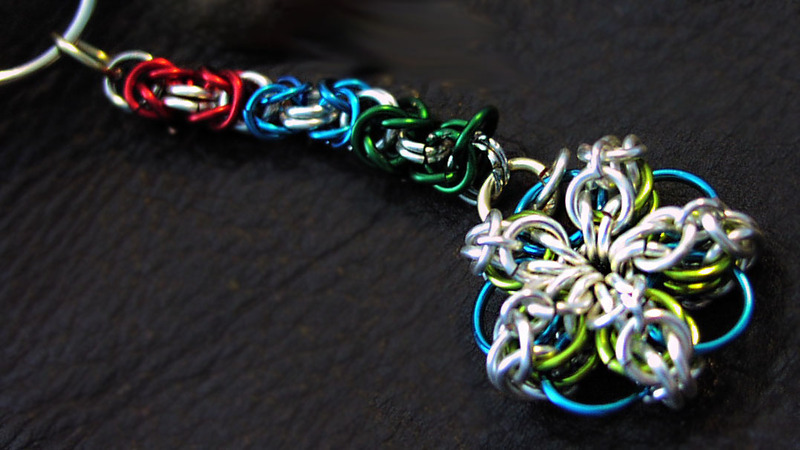 Orbitals are chainmaille rings that are not hooked into anything-- they are trapped inside of other rings to be held in place. 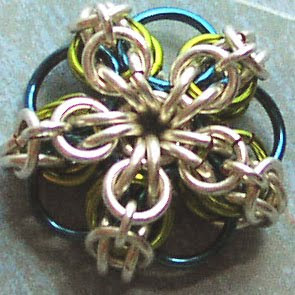 (The Helm weave which I have used in my Geometric Flower and Chainmaille Bracelet uses orbitals). While the firework dangles are not technically orbitals, they look like it. And the little red rings on the top certainly are. What a boring name. 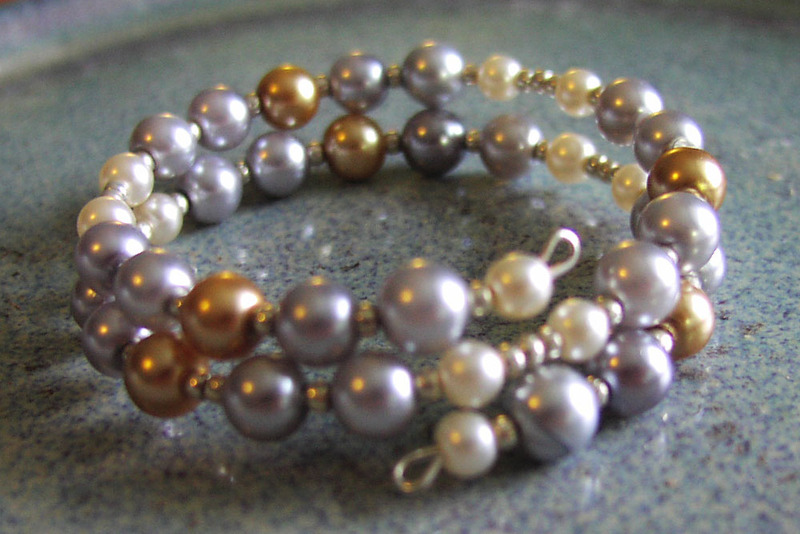 "Pearl Bracelet". I took some memory wire (the wire that stays in a bracelet shape even when stretched) and threaded on some glass pearls and little beads inbetween them. A few days ago we had some families over. Of course, for much of the time I got stuck with the little girls instead of my friends my age (well, some of my friends my age hung out with me and the little girls). That's just the curse of being a hostess. I thought I'd give them some jewelry tips. I helped one girl make some clip on earrings. The above picture is the creation of 9 year old S. I was occupied with the other girls for awhile, but she simply paid attention to what I was teaching them and made that tiara-- all by herself! I was very surprised when I turned around she said, "Shaylynn, look what I made!" My good friend G. made this one. The simple elegance is so understated, I love it! K., modeling the Crown of Stars. K. and I were both actors in Skits at VBS (aka, Catholic Camp). 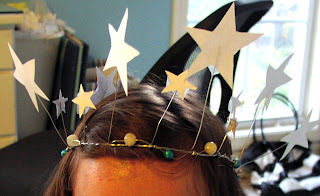 This year was the Glorious Mysteries, and we needed a crown of twelve stars (Revelation... I forget the verse) for Mary's coronation. This is my second ring of this kind; the first was much better. However, I had gotten it out to show my little cousins and can't find it now. I made this one to teach them how to make it. 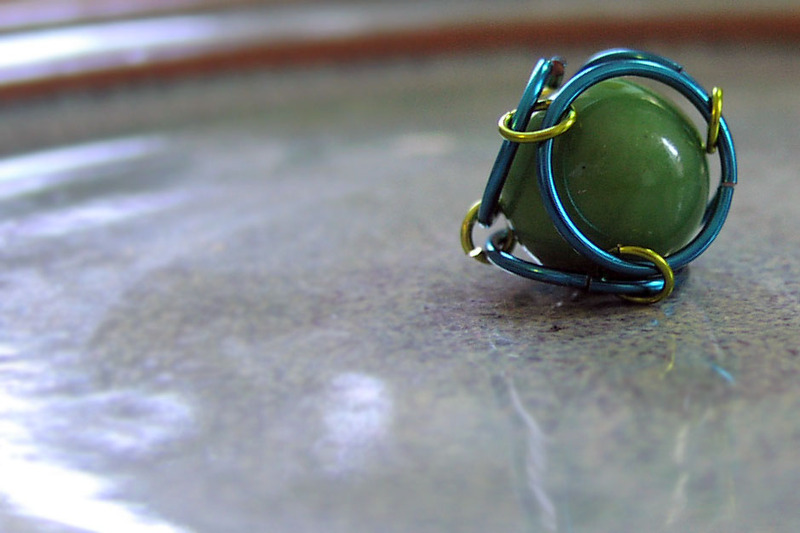 I used an 18 ga wire as the base of this ring. 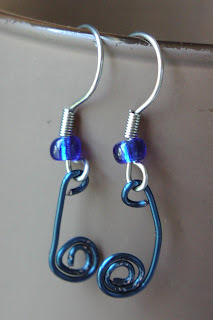 I twisted it around my finger twice, finshing off the ends with a flourish (as pictured). We had a pretty family tree picture frame a few years ago; unfortunately we never used it. While cleaning up to sell the house, I accidentally broke the top branch. I pulled the dangling picture frame from the branch and added some fun beads. Simple and fun! I'd give instructions but I doubt anyone else has saved a broken peice of a picture frame. :D It just goes to show that anything can be used if you have a pinch of creativity. 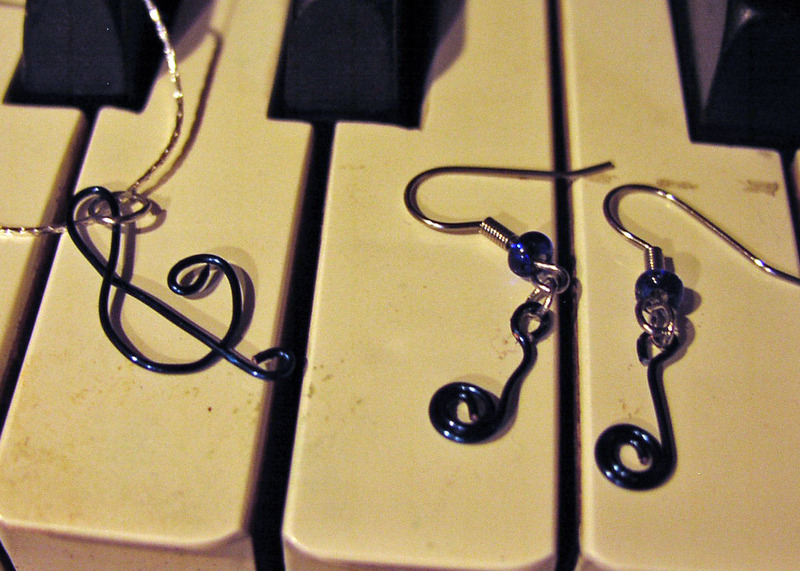 A treble clef and two quarter notes for the musician at heart. 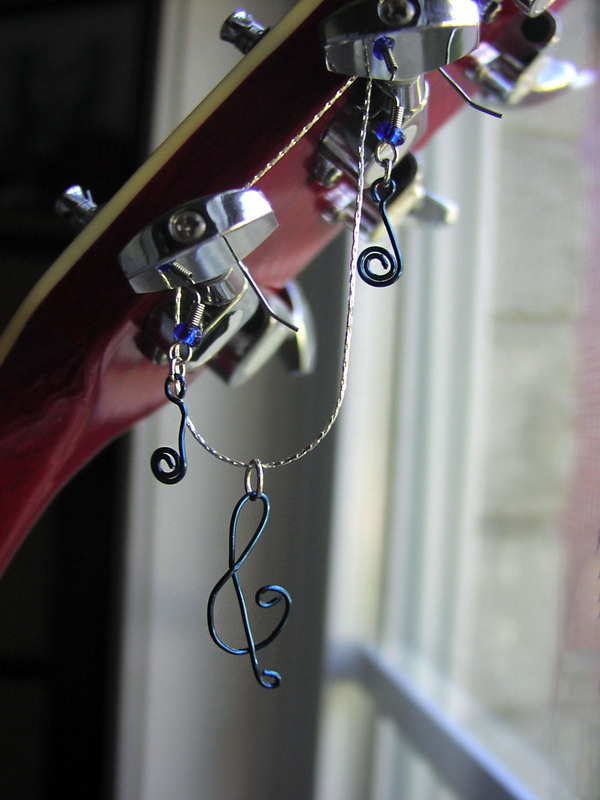 That would be me; I love music even though I am quite terrible at it. Fun and funky. Unfortunately, I can't give good instructions for chainmaille, even a simple thing like this. So I will simply post pictures. 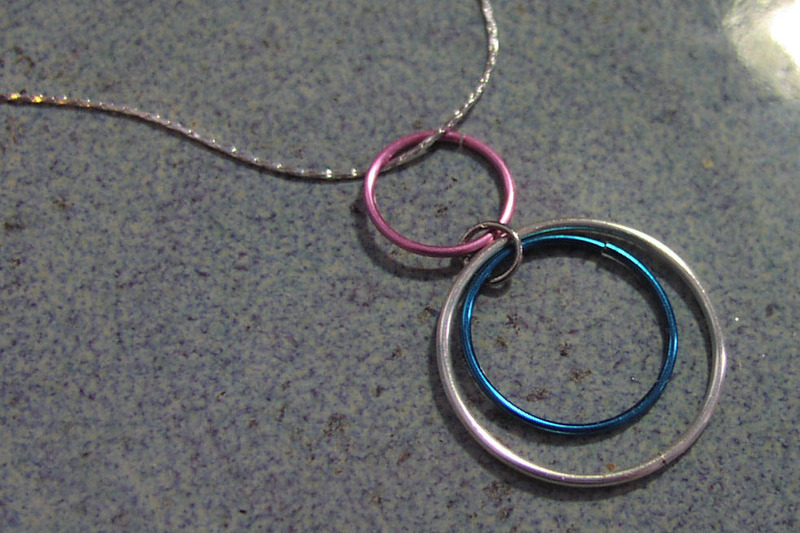 The chain can be hooked through any one of the rings. Blame my mother for the name. 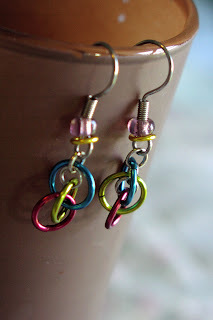 She is the math geek, and her first remark on this chainmaille charm was "Oh, wow... I love this. It's so geometric!" Which I suppose it is. Geometricity is the nature of chainmaille, and it is a very pleasing look! I made this from the few similar size-and-color rings I got in my sample set from UnkamenGifts. (I should have just ordered multiple colors of one size!). It is a helm weave folded in on itself. 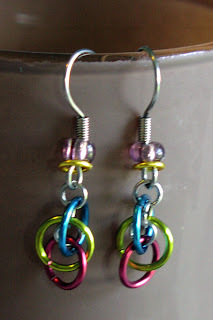 My first attempt at this pattern was pictured HERE. This is so tiny that it would work well as earrings, too. If I had enough rings. I know, I am wowing something that I made. 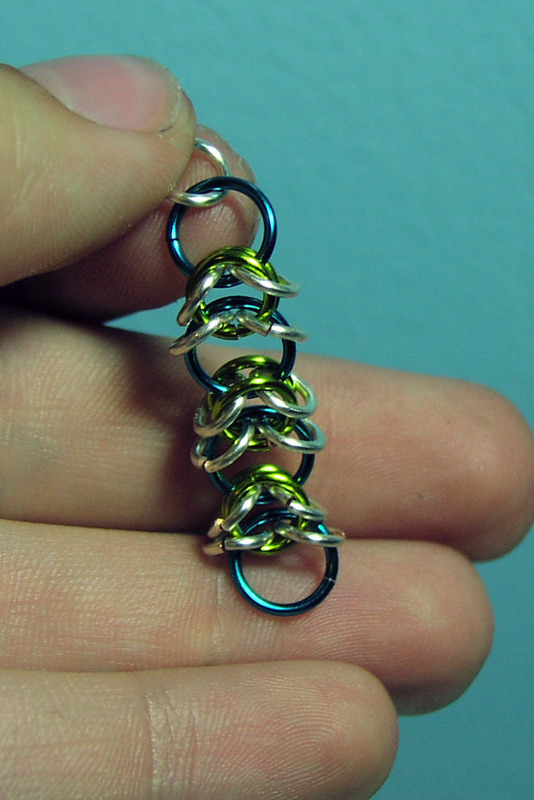 But I just had no idea you could do this with chainmaille. In my first post on chainmaille, I mentioned that I first ran across it three or four weeks ago at UnkamenGifts' Summerfest booth. 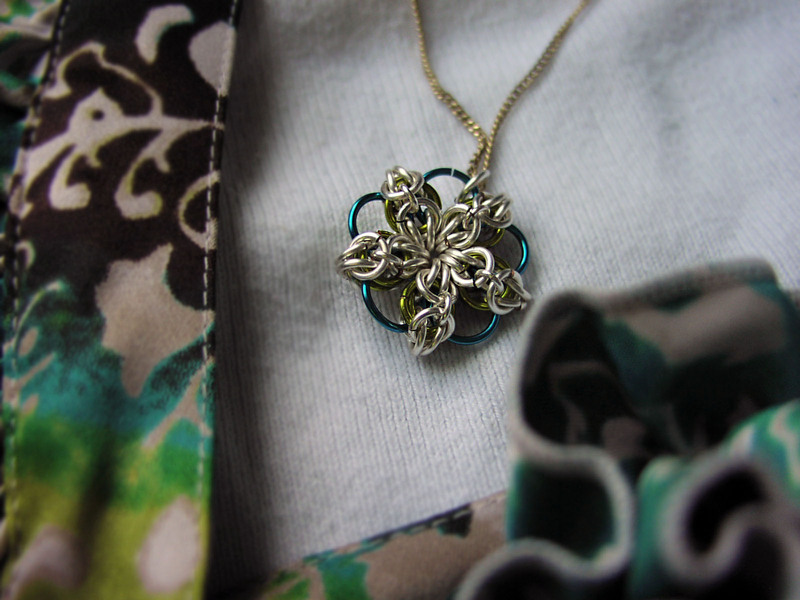 Instead of buying a necklace from them, as I originally planned, I bought their Celtic Flower Kit. I picked out my colors, and they gave me the exact sizes. I then used their tutorial on Flickr. 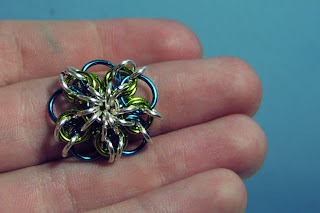 Of course, I used cheap rings from Hobby Lobby and rings that I made to weave my first flower. I wanted to be sure I could do it before using the good jumprings. 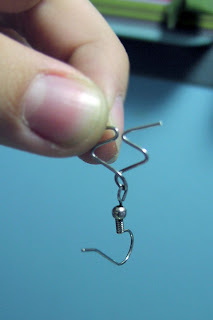 I found that the needle-round-nose pliers I have have a "tooth" that harms the copper rings I bought. The only other pair of pliers I had was a pair of small needle-flat-nose in bad shape from Dad's toolkit. I needed two pliers to open the copper rings, so I raided his giant toolbox again, and emerged triumphantly with a pair of way-too-big flatnose pliers/clippers. 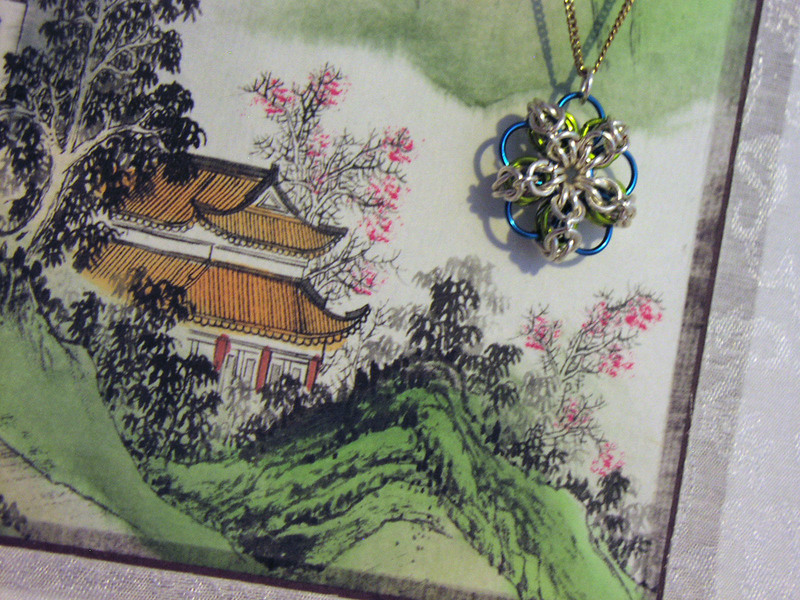 If I am careful, I can use the corner of it as jewelry pliers. 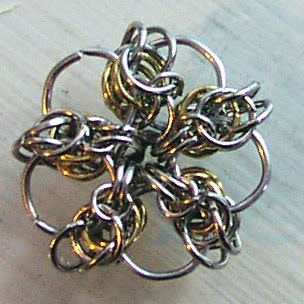 This is the Celtic Flower halfways through it's creation-- it begins as a string of complicated chainmaille knots. It looks like dragon scales, doesn't it? 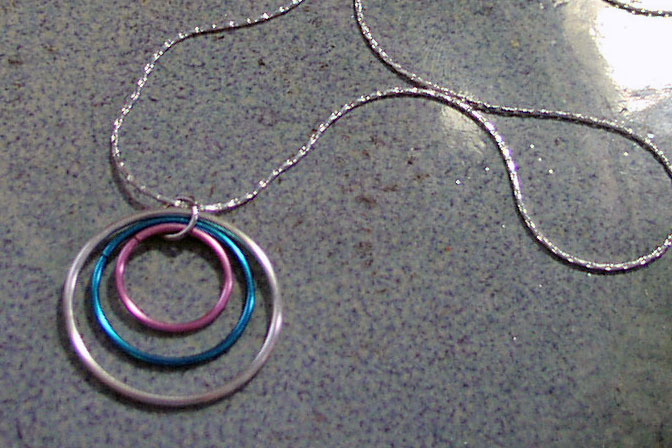 Then the chain is pulled into a circle. At this point the flower was incredibly floppy. Here is the completed flower with the "structural rings" woven in. And then I had fun taking pictures. 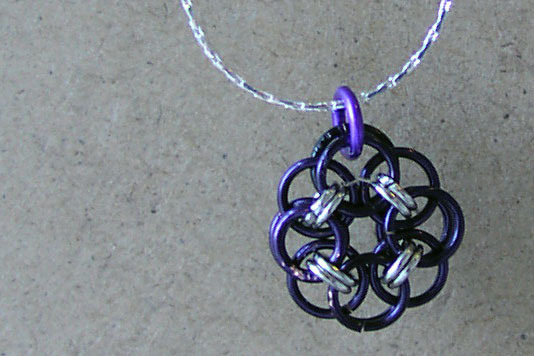 The chain is an intricate box weave called the Byzantine. 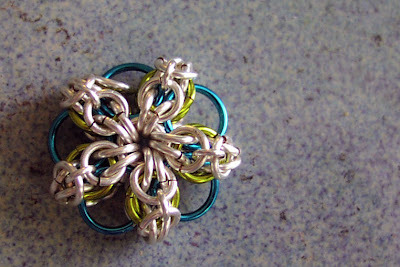 Instruction can be found in the "Byzantine Weave" set on UnkamenGift's Flickr.